A member of one of the most alert and focused breeds of miniature bunnies, this little one fancies itself a fierce protector- she's sure to rattle if she senses trouble coming. 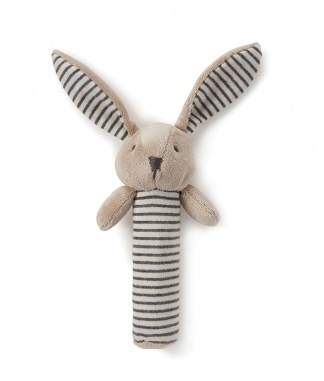 While hand squeaker toys have limited squeaks, these gorgeous baby rattles will never run out of rattle! And unlike squeakers, there's no toddler strength needed to produce the desired sound: babies will enjoy rattling these little softies as gently as they please.